There are two distinctive footage available. The one is a studio live performance on a certain TV program, and the other is an edited film of a concert. The former one, studio live on TV, is from the TV program “Teatro 10”. The length of the entire show is somewhat short, probably because of the air time limitation – Mr. Brown and his band plays each tune very compact, but the whole energy is the bomb! It’s definitely the near-perfect state of the band, featuring William “Bootsy” Collins and Phelps “Catfish” Collins, both of whom was going to leave the band shortly. In Mr. Brown’s long long carrer, two periods – the band of late 1969 (featuring Maceo Parker), and the band of early 1971 (featuring the Collins brothers) – are two distinctive creative peaks with ultimate perfection, superbad energy and avant-garde music. Some sources say this TV performance was filmed on April 24, 1971, but it can’t be possible. Collins brothers did quit Mr. Brown’s band in March 1971, soon after the legendary “Love Power Peace” live in Paris, March 8-9, 1971. Furthermore, Mr. Brown recorded the very first tune (Escape-Ism) with the new members (including Cheese Martin and Fred Thomas) on April 8, 1971. BTW the Paris concert was initially scheduled as a triple LP album (King SLP-1137) but unreleased; then in 1992, one CD (Polydor 314 513 389-2) of the same album title with different mix, different edits, different takes was finally released, and all JB fans danced for joy like crazy. I suppose “April 24th” was the day this TV program was aired for the first time. And the real date was sometime from late February to early March, before the band toured Paris, France – this would be highly probable. Just after I wrote the lines above, I sent an e-mail to Mr. Harry Weinger to make sure if my guess was correct – and it turned out to be. So this TV program was filmed on March 2, 1971 – now I feel so refreshed! So many thanks for the info, Harry-san! First aired (probably) on April 24, 1971. 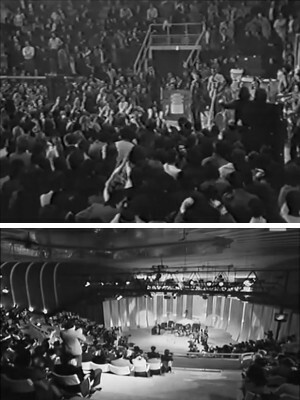 The other B/W footage was filmed at the Palasport, Bologna, Italy. Not an unedited & complete performance on the stage, but edited certainly for TV broadcast. As a matter of fact, you see the female announcer/presenter (Miss Martitia Palmer) appearing at the desk during the footage. Anyway the performance here is superb, again. I would go crazy and would be stupefied for sure, if I was watching live in the stadium! This stage, again, is said it was in April or August 1971 – but again, this can’t be possible. The performance, the arrangement, the look – everything looks the very similar to the above “Teatro 10” TV performance. This should be in late February to early March as well. Last of all, here’s the link to the web pages, both shows how Mr. McBride loves, respects and admires Mr. Brown (and his music). I so much love your music too of course, McBride-san! and tagged 1971, Bootsy Collins, Christian McBride, Harry Weinger, Italy, James Brown, YouTube.